Mark Donnellan 4 – some very poor kick-outs. Over the sideline, and a few in succession down the throat of Donegal men. David Hyland 3 – old fault of standing off and getting beaten to every ball resurfaced. Found Gallen too hot to handle. Mick O’Grady 3 – worst game for a long time. Hardly a tackle made and schooled by Murphy. Kevin Flynn 3 – at least made a couple of attempts to rally his colleagues in first half but shot an awful wide and poor pass the second time. Stupid sending off. Cian O’Donoghue 3 – half back line presented no barrier whatsoever. Eoin Doyle 2 – when we needed our captain he gets himself sin-binned. Didn’t see the incident but he didn’t seem to complain too much. Really poor game before that and must be held accountable as skipper and centre-back for at least some of the guard of honour afforded to Donegal in the first-half. Peter Kelly 4 – part of that defence so enough said really. Couple of gallops in first-half. At least he looked bothered and made some attempt to get in front of his man. Kevin Feely 4 – completely over-run at midfield. No influence. Tommy Moolick 3 – completely over-run at midfield. No impact. Fergal Conway 3 – hardly involved. Worst game for a long-time. Doesn’t seem fit although that could be said of a few/most. Chris Healy 4 – better in second-half after little involvement before the break but didn’t get on the scoresheet and missed the one goal chance we created. Keith Cribbin 2 – hardly touched the ball again to continue a poor run of form. Withdrawn at half-time. Neil Flynn 3 – see Fergal Conway comments. 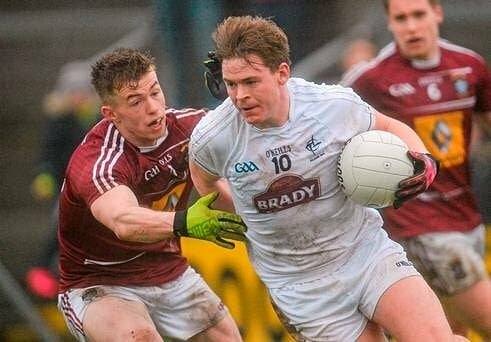 Paddy Brophy 4 – was actually not the worst Kildare player on the park, which could be deemed an improvement. Not fit enough for inter-county football on recent showings. Jimmy Hyland 5 – at least he was clearly trying. Unable to make any inroads in first-half but did score twice in second. The one from the right corner was the “highlight” of the day for Kildare. *Adam Tyrrell 7 – Came on at half-time and, albeit with the benefit of the wind, gave an exhibition of shooting. Effort too. Well done. James Murray 4 – wish the Moorefield James Murray would show up in a Kildare shirt the odd time. Maybe he just needs a run in the team. Aaron Masterson – 4 – difficult to make an impact in those circumstances and he didn’t. Tony Archbold/Mark Barrett – not on long enough. They won’t remember their competitive debuts with any fondness.